"You measure yourself by the people who measure themselves by you." Image Transfer Review: From the opening shot of the Himalaya Mountains, with jagged, snowcapped peaks jutting into a crystal blue sky, it's quickly apparent the 1080p transfer of The Bucket List is top-notch. Detail is exceptional, especially when the camera zeroes in on the craggy, timeworn faces of Nicholson and Freeman. Never have Freeman's freckles been more beautifully pronounced; ditto Nicholson's trademark eyebrows. Actors of their caliber express so much with an understated glance, grin, or grimace, and the crisp high resolution image heightens the impact of many such moments. The sharp edges never look enhanced, colors are rich and true, fleshtones come off naturally, and contrast seems almost perfectly pitched. Of course, the travelogue sequences are by far the most breathtaking in HD, with shots of the Giza pyramids (gorgeous at twilight), the Taj Mahal, the African Serengeti, and China's Great Wall producing the "wow" factor that's the ultimate selling point of Blu-ray. Even the drab hospital interiors possess a clinical crispness that's pleasing to the eye. Best of all, no compression artifacts or digital noise could be detected, and the spotless source material still retains a warm celluloid look. Excellent job, Warner. Audio Transfer Review: Sure, The Bucket List is a dialogue-driven drama without the explosions and gunfire that distinguish most action blockbusters, but that doesn't excuse Warner's decision to forego high-def audio in favor of a standard DD 5.1 track. Part of Blu-ray's appeal is the spectacular sound the platform is capable of providing, and The Bucket List�particularly during its skydiving and racing sequences�would certainly have benefited from uncompressed audio. That said, the DD 5.1 track suffices, offering a well-balanced, broad sonic field with appropriate peaks and valleys. Dialogue remains prominent throughout, and Marc Shaiman's music complements the action without overwhelming it. Surround activity is spotty at best, and bass frequencies are, for the most part, muted. All in all, a solid effort from Warner, but hopefully the studio will make high-def audio a standard component on future Blu-ray releases. Extras Review: Sadly, all of the disc's special features are in standard definition, but there are several extras exclusive to this Blu-ray edition. First up, The Bucket List Trivia Track provides a handful of interesting nuggets in pop-up fashion, but nothing really substantive. We learn a few personal details about the actors, where stunt doubles were used, which scenes were shot on a soundstage instead of on location, and some behind-the-scenes info. Unfortunately, long gaps between pop-ups make viewing a chore, and none of the items are selectable like the packaging promises. Unless you're a diehard fan of the film, definitely skip this time-waster. Another exclusive, Rob Reiner Interviews the Stars allows the film's chatty director to shoot the breeze with both Nicholson and Freeman. The Nicholson piece runs 22 minutes and touches upon the actor's own health crisis that almost prevented him from making the movie (and added depth to his portrayal), his previous collaboration with Reiner on A Few Good Men, and the joy of working with Freeman. Freeman joins Reiner via satellite from New York, where he's rehearsing The Country Girl for Broadway, and their mutually admiring 17-minute discussion addresses Morgan's initial reluctance to take part in the project, the efficiency of Reiner's direction, the differences between stage and screen acting, and their daily "morning hug" on the set. Judging by these interviews, Reiner won't be getting his own daytime talk show anytime soon, but proves an affable questioner and creates a comfortable rapport with his subjects. 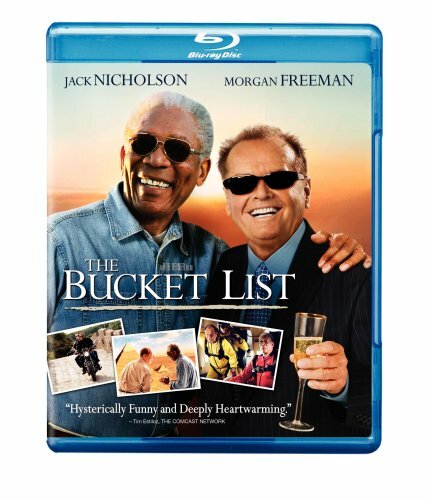 Writing a Bucket List, which also appears on the standard DVD release, is a puffy five-minute featurette in which screenwriter Justin Zackham talks about the genesis of his script, and hawks a book full of bucket lists garnered from both celebrities and common folk. (Proceeds from the volume, available on Amazon, go to charity). A music video of John Mayer's catchy Say, the closing credits tune, runs four minutes, and The Making of "Say" (another Blu-ray exclusive) clocks in at five-and-a-half minutes�although it's really just an interview with Mayer in which he speaks about his inspiration for the song and the importance of the movie's subject matter. The Bucket List reminds us to embrace life as fully as we can while we can, but first and foremost, it's an actor's showcase for Jack Nicholson and Morgan Freeman. The joie de vivre these two legends bring to Rob Reiner's film is worth the price of the disc, and their seamless work adds potency to the picture's uplifting message. Warner's Blu-ray edition boasts a stunning 1080p transfer and some exclusive extras, but the lack of HD audio is disappointing, and the supplemental material (in dull standard def) isn't as extensive as one would hope. Still, whether you're 17 or 75, this warm, touching movie merits a recommendation, and might inspire you to start compiling a bucket list of your own.